Maejo University, also spelled Maecho University located in Chiang Mai Province, Thailand, is the oldest agricultural institution in the country. Founded in 1934 as the Northern Agricultural Teachers Training School, it was restructured and renamed several times until it gained the status of a full-fledged public university in 1996 and since then has been known as Maejo University. Maejo University main campus at Chiang Mai is composed of the Faculties of Agricultural Business, Agricultural Production, Science, and Engineering and Agro-Industry. In addition to these, the university has two smaller campuses in Phrae and Chumphon. President Thep Phongparnich was awarded Oklahoma State University’s Distinguished International Alumni Award on November 12th, 2005. The two universities have formed an alliance. Maejo University has been noted for particularly cruel initiation rites of freshmen, forcing them to perform military like exercises in warm weather which has caused many of them to fall ill. 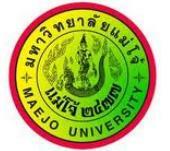 Founded in June 7, 1934, Maejo University (MJU) is considered as Thailand’s oldest agricultural institution. It was first established as the Northern Agricultural Teachers Training School under the Ministry of Education and was later transferred under the Ministry of Agriculture to become the Kasetsart Preparatory School. After a year, it was officially installed as Maejo Agricultural School to serve as a research station of Kasetsart University (KU), a state university in Bangkok. It began to accept M.6 (Grade 12) students who, upon finishing at Maejo, were automatically admitted to KU for a 4-year degree program. In 1956, Maejo was renamed Chiang Mai College of Agriculture, making it the first certificate-granting agricultural college under the Ministry of Education. Its graduates became secondary school teachers in agriculture. In 1975, Maejo was royally confirmed as a state universitiy under the Ministry of University Affairs but was called the Institute of Agricultural Technology. With this status, however, it began to accept students from vocational schools to its 2-year programs (associate degrees), and students from secondary schools to its 4-year degree programs. This was aimed to give all vocational This was aimed to give all vocational school graduates greater opportunity to attain higher education in in agriculture. The 19th of February is thus celebrated as MJU’s Foundation Day. In 1980, the instituteย?s name was again changed into Maejo Institute of Agricultural Technology upon the request of its alumni. However, due to its rapid development, it was elevated into a full and complete university status on November 12, 1996. It was given the name Maejo University which was immediately approved by the national parliament. Under the Ministry of Education, Maejo University is a degree-granting institute that attempts to educate students in practical agriculture, aiming to prepare them for agricultural pursuits. MJU strives to nurture and develop its graduates to become technically competent, besides being culturally and scholarly matured thereby, able to contribute to the future of the country. At present, Maejo University belongs to the Commission on Higher Education of the Ministry of Education.